Meets FDA and USDA requirements for incidental food contact. Fortified with high load carrying solid lubricants, it lubricates and protects bearings, gears and other moving parts exposed to high temperatures up to 475ºF and wash downs. The unique dispersion of FDA authorized PTFE provides additional lubricity especially where a thin film of lubricant is desirable. 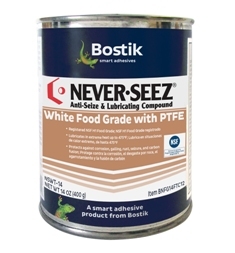 Never-Seez White Food Grade with PTFE is virtually odorless, colorless, and tasteless. It is a "multi-purpose" lubricant for varied services within a food handling plant.